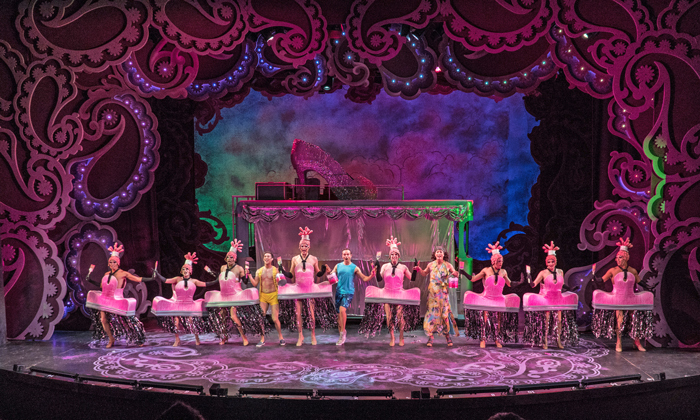 A perfect example of this creative boost is the newly opened “Priscilla, Queen of the Desert.” With booty shaking music and enough costume changes to boggle the mind, this musical will have audiences grinning from ear to ear for over two hours. Set in the Australian Outback, “Priscilla, Queen of the Desert” follows three drag queens who are working through contrasting points in their lives. Tick (also known as Mitzi) is the main character who harbors a secret life while planning a road trip across Australia. The journey culminates in a big performance that changes his future. Tick is joined on the trip by Bernadette, an older queen who champions the art of lip synch, and Adam (also known as Felicia), the sassy youngster with a Kylie Minogue obsession. Last, but certainly not least, is Priscilla, the moniker of the small pink bus with never-ending room for fabulous costumes. For the most part, the musical stays celebratory and upbeat, but the production isn’t afraid to touch on topics like sexuality, gender and the pain that comes with being misunderstood. 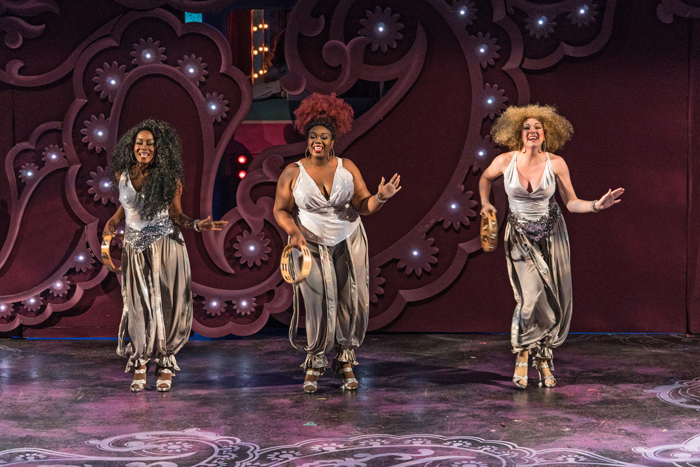 While the performance may redden the cheeks of more traditional viewers, for those who embrace the spirit of the Priscilla, the musical can be a rewarding excursion through a landscape of camaraderie doused in glitter. If the story sounds familiar, perhaps the 1994 film, “The Adventures of Priscilla, Queen of the Desert” staring Hugo Weaving, Guy Pearce and Terence Stamp rings a bell. According to a section of the musical’s playbill written by director Abe Reybold, the movie achieved cult status and “both shocked and rocked the world, leaving an indelible mark on the Australian film industry and beyond.” Anything this colorful and music-fueled would naturally appeal to Austin audiences, too. Josh Denning leads the cast as Tick. He welcomes the audience with his beautifully deep, buttery vocals while Jack Donahue gracefully emotes Bernadette’s story all the way to the back of the venue. Anthony Vincent Toudjarov rounds out the trio by playing Adam/Felicia with flare and youthful ambition. There are some wonderful female voices, as well, like Chanel Haynes-Shwartz who completely blows listeners away as part of the ensemble cast. The Austin cast makes the costumes look easy to wear and perform in, though I’ve heard the signature pyramid pants are weighed down with rather heavy shoes. Between all of the infectious energy on stage, audiences would never guess that anything is less than a second skin. 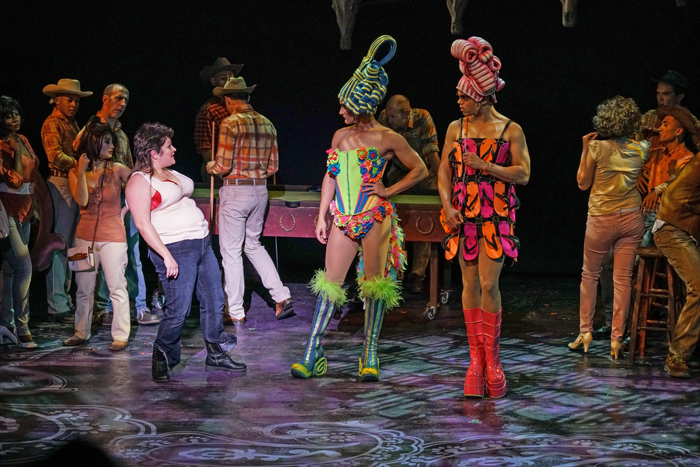 ZACH’s “Priscilla, Queen of the Desert” never allows a wasted moment on stage. Something stimulating is always treating the audience’s eyes and ears. There’s even a subtly charming moment during the intermission (that’s not a part of the show) when a crew member walks around the stage to sweep away stray feathers and glitter adorning the floor after vigorous dance numbers. 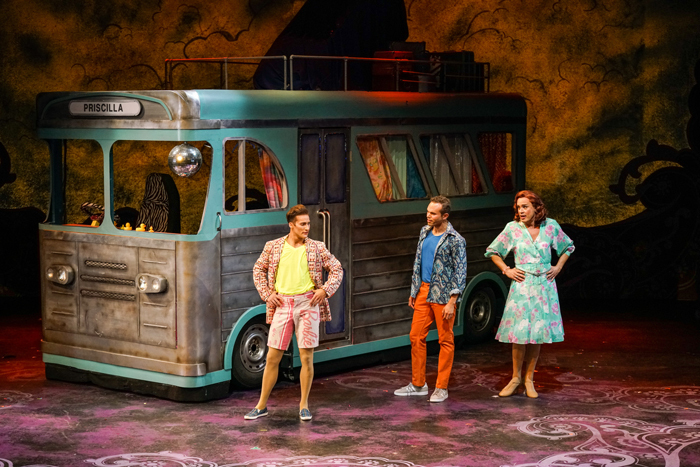 Zach Theatre’s production of “Priscilla, Queen of the Desert” runs until the end of October with tickets available online. Pricing ranges from $29-81 before fees. Keep in mind that, according to ZACH’s website, the show is appropriate for ages 13 and up. It deals with adult situations and there’s some suggestive dancing and cursing. Grab your friends and join the gals on a road trip across the desert! 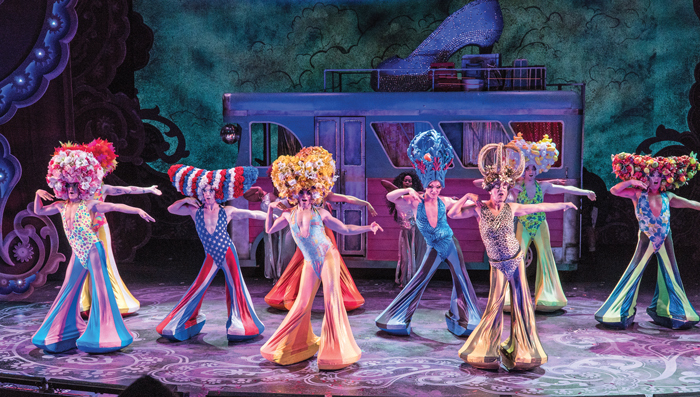 Which “Priscilla, Queen of the Desert” costume is your favorite? Disclosure: I attended a complimentary press viewing of the play for the purposes of this review. All opinions are my own.